Welcome back to everyone for the start of Semester Two. Over the break, many College activities took place and I am grateful to all the staff involved in supporting students whether it was in making improvements to existing facilities, supervising Musical rehearsals or running additional classes. It’s only a few weeks away! The Mater Christi College and St Joseph’s College production of The Wedding Singer is in the final stages of rehearsal following months of work by dedicated staff and students. Tickets are now on sale, and I urge you to secure your seats as the shows are sure to sell out. Tickets can be purchased by clicking on this link. Enrolments for Year 7 2020 close on Friday 17 August 2018. Should you have relatives or friends who are interested in joining the St Joseph’s College community, please let them know to check our website for details of enrolment procedures, tours and events. Siblings of current students do need to ensure that an application is submitted. 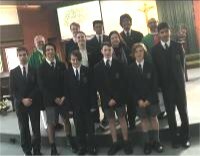 Twelve students and four staff returned from Kiribati having spent time developing the relationship between St Joseph’s College and the community within the central Pacific Ocean. Mr Dylan Price superbly led this annual event with the support of Mrs Tracey Ashton, Mrs Kerrie Stone and Mr Thomas Murphy. We welcome back Christian Kiel (11 Cantamessa) and William Doyle (11 O’Mara) who returned from their recent immersion to Samoa as part of the Caglerio Program. The inaugural Queenstown Ski Trip took place over the holidays. Thanks to Mr Patrick van Dyk who organised the trip and to Mr Andrew Cooper, Mr James Love and Mr Gary Lewis who participated to support the many boys who tackled the slopes of Coronet Peak and The Remarkables. Towards the end of Term 2, we held a Mass in the Parish of St Joseph’s, Boronia. I would like to acknowledge Fr Mirek Knap, Father Martin Tanti, staff, students and families who participated. Thank you to Miss Bronwyn Dean who prepared the students. Rex Ball (10 Edwards) and Noah Hutchins (7 Cantamessa) spoke well about the impact the College continues to have on their lives. Have you ever considered being a Homestay Family for an International Student? Please contact my Personal Assistant, Ms Janelle Spring, on 9756 3112 should you be interested in finding out more about this opportunity. At the start of this term, we welcomed back Ms Marie-Louise Bamford and Mr Brendan Leane from significant periods of leave. Congratulations to Charles Opoku and his wife who have welcomed a daughter, Anouk. Our condolences are extended to William Fitzpatrick and his family. Will’s mother, Shellie, died recently. This Monday 23 July is a pupil free day. Staff from Aquinas College, Mount Lilydale Mercy College and St Joseph’s College are participating in a Staff Formation Day with Father Timothy Radcliffe OP.